Julio is a local music producer who was facing over 20 years. He was arrested at his home where there were alleged complaints of a domestic disturbance. When the police came, they immediately took Julio to the ground. Police also pushed his then 8-month pregnant wife, which Julio was upset about, but because he was already in police custody, he could not do anything. He was taken to jail. What he thought was going to be a drunk in public charge turned out to be charges of resisting arrest, making threats to an officer and gang enhancement. Police officers charged that Julio threatened the arresting officer who drove him to the jail. 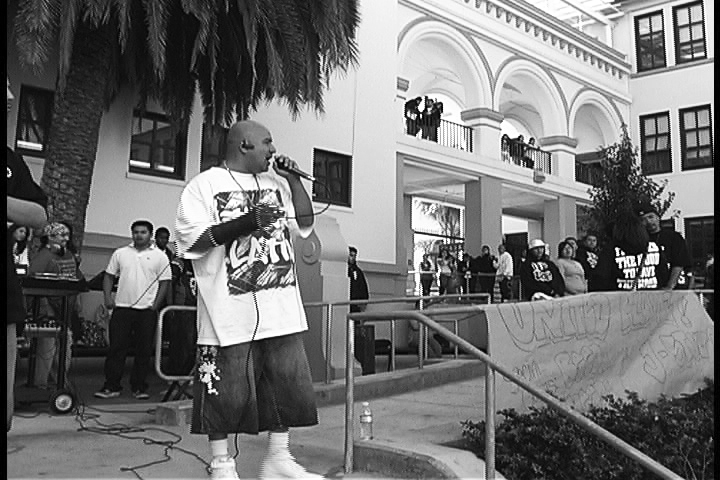 Furthermore, police officers and the district attorney wanted to add on gang enhancement charges, claiming he was part of a gang – despite the fact that in addition to being a businessman that gave opportunities to young people to pursue their music, Julio was in fact a youth counselor who advised youth against violence. The fact that one of the most secured and vetted institutions possible – the California State Prison – has repeatedly allowed Julio to come in should be indicative that the system that would be most wary and sensitive of any gang activity obviously felt Julio was not a gang member. Julio approached De-Bug during the preliminary phase of his trial. He had a vigorous attorney on his side – Paula Canny – who defended him passionately. She was sharp, open to community, and an amazing attorney. Paula fought from the start of the case, launching investigations and requesting paperwork that would ultimately reveal how Julio was targeted by the police department for his music. With De-Bug’s assistance, Julio read through all his police reports and discovery – including a thick “gang packet” that made Julio out to look like he was the county’s most wanted. Julio and De-Bug put together our own analysis of the gang packet, helped organize community support, attended Julio’s hearings, and met with his attorney. The information that was put together also helped his attorney when challenging the gang allegations — which carried the most time. OUTCOME: All this hard work resulted in Julio beating the gang enhancement charges and threats on an officer. He is now back with his wife and son, continues to produce music and counsel youth who are at-risk of joining gangs.